The environmental impact of fishing includes issues such as the availability of fish, overfishing, fisheries, and fisheries management; as well as the impact of fishing on other elements of the environment, such as by-catch. These issues are part of marine conservation, and are addressed in fisheries science programs. There is a growing gap between the supply of fish and demand, due in part to world population growth. Similar to other environmental issues, there can be conflict between the fishermen who depend on fishing for their income, and fishery scientists whose studies indicate that if future fish populations are to be sustainable then some fisheries must reduce or even close. The journal Science published a four-year study in November 2006, which predicted that, at prevailing trends, the world would run out of wild-caught seafood in 2048. The scientists stated that the decline was a result of overfishing, pollution and other environmental factors that were reducing the population of fisheries at the same time as their ecosystems were being annihilated. Yet again the analysis has met criticism as being fundamentally flawed, and many fishery management officials, industry representatives and scientists challenge the findings, although the debate continues. Many countries, such as Tonga, the United States, Australia and Bahamas, and international management bodies have taken steps to appropriately manage marine resources. Some fishing techniques also may cause habitat destruction. Blast fishing and cyanide fishing, which are illegal in many places, harm surrounding habitat. Bottom trawling, the practice of pulling a fishing net along the sea bottom behind trawlers, removes around 5 to 25% of an area's seabed life on a single run. A 2005 report of the UN Millennium Project, commissioned by UN Secretary-General Kofi Annan, recommended the elimination of bottom trawling on the high seas by 2006 to protect seamounts and other ecologically sensitive habitats. This was not done. Overfishing has also been widely reported due to increases in the volume of fishing hauls to feed a quickly growing number of consumers. This has led to the breakdown of some sea ecosystems and several fishing industries whose catch has been greatly diminished. The extinction of many species has also been reported. According to a Food and Agriculture Organization estimate, over 70% of the world’s fish species are either fully exploited or depleted. According to the Secretary General of the 2002 World Summit on Sustainable Development, "Overfishing cannot continue, the depletion of fisheries poses a major threat to the food supply of millions of people." The cover story of the May 15, 2003 issue of the science journal Nature – with Dr. Ransom A. Myers, an internationally prominent fisheries biologist (Dalhousie University, Halifax, Canada) as the lead author – was devoted to a summary of the scientific information. 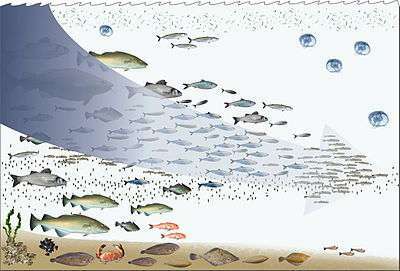 The story asserted that, as compared with 1950 levels, only a remnant (in some instances, as little as 10%) of all large ocean-fish stocks are left in the seas. These large ocean fish are the species at the top of the food chains (e.g., tuna, cod, among others). This article was subsequently criticized as being fundamentally flawed, although much debate still exists (Walters 2003; Hampton et al. 2005; Maunder et al. 2006; Polacheck 2006;Sibert et al. 2006) and the majority of fisheries scientists now consider the results irrelevant with respect to large pelagics (the open seas). Fishing may disrupt food webs by targeting specific, in-demand species. There might be too much fishing of prey species such as sardines and anchovies, thus reducing the food supply for the predators. It may also cause the increase of prey species when the target fishes are predator species such as salmon and tuna. Bycatch is the portion of the catch that is not the target species. These are either kept to be sold or discarded. In some instances the discarded portion is known as discards. Even sports fisherman discard a lot of non-target and target fish on the bank while fishing. Recent research has shown that fishing debris such as nets, buoys, and lines, accounts for a majority of plastic debris found in the oceans, such as in the Great Pacific garbage patch. Similarly, fishing debris has been shown to be a major source of plastic debris found on the shores of Korea. Many governments and intergovernmental bodies have implemented fisheries management policies designed to curb the environmental impact of fishing. Fishing conservation aims to control the human activities that may completely decrease a fish stock or washout an entire aquatic environment. These laws include the quotas on the total catch of particular species in a fishery, effort quotas (e.g., number of days at sea), the limits on the number of vessels allowed in specific areas, and the imposition of seasonal restrictions on fishing. In 2008 a large scale study of fisheries that used individual transferable quotas and ones that didn't provided strong evidence that individual transferable quotas can help to prevent collapses and restore fisheries that appear to be in decline. Fish farming has been proposed as a more sustainable alternative to traditional capture of wild fish. However, fish farming has been found to have negative impacts on nearby wild fish and farming of predatory fish like salmon can rely on fish feed that is based on fish meal and oil from wild fish. The environmental impact of recreational fishing may be alleviated to some extent by catch and release fishing. ↑ Worm, Boris; et al. (2006-11-03). 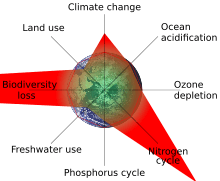 "Impacts of Biodiversity Loss on Ocean Ecosystem Services". Science. 314 (5800): 787–790. doi:10.1126/science.1132294. PMID 17082450. Retrieved 2006-11-04. ↑ Juliet Eilperin (2 November 2006). "Seafood Population Depleted by 2048, Study Finds". The Washington Post. ↑ Eriksen, Marcus; Lebreton, Laurent C. M.; Carson, Henry S.; Thiel, Martin; Moore, Charles J.; Borerro, Jose C.; Galgani, Francois; Ryan, Peter G.; Reisser, Julia (2014-12-10). "Plastic Pollution in the World's Oceans: More than 5 Trillion Plastic Pieces Weighing over 250,000 Tons Afloat at Sea". PLOS ONE. 9 (12): e111913. doi:10.1371/journal.pone.0111913. ISSN 1932-6203. PMC 4262196 . PMID 25494041. ↑ Jang, Yong Chang; Lee, Jongmyoung; Hong, Sunwook; Lee, Jong Su; Shim, Won Joon; Song, Young Kyoung (2014-07-06). "Sources of plastic marine debris on beaches of Korea: More from the ocean than the land". Ocean Science Journal. 49 (2): 151–162. doi:10.1007/s12601-014-0015-8. ISSN 1738-5261. ↑ Costello, Christopher; Gaines, Steven D and Lynham, John (2008) Can Catch Shares Prevent Fisheries Collapse? Science Vol 321, No 5896, pp 1678–1681. 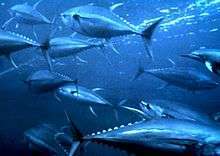 ↑ A Rising Tide: Scientists find proof that privatising fishing stocks can avert a disaster The Economist, 18th Sept, 2008. ↑ New study offers solution to global fisheries collapse Eureka alert. ↑ PLoS Biology - Can Farmed and Wild Salmon Coexist? Castro, P. and M. Huber. (2003). Marine Biology. 4thed. Boston: McGraw Hill. Hampton, J., Sibert, J. R., Kleiber, P., Maunder, M. N., and Harley, S. J. 2005. Changes in abundance of large pelagic predators in the Pacific Ocean. Nature, 434: E2-E3. Maunder, M.N., Sibert, J.R. Fonteneau, A., Hampton, J., Kleiber, P., and Harley, S. 2006. Interpreting catch-per-unit-of-effort data to assess the status of individual stocks and communities. ICES Journal of Marine Science, 63: 1373-1385. Myers, Ransom and Boris Worm. (May 15, 2003). "Rapid worldwide depletion of predatory fish communities," Nature, Vol 423. London: Nature Publishing. Polacheck, T. 2006. "Tuna longline catch rates in the Indian Ocean: did industrial fishing result in a 90% rapid decline in the abundance of large predatory species?" Marine Policy, 30: 470-482. FAO Fisheries Department. (2002). The State of World Fisheries and Aquaculture. Rome: Food and Agriculture Organization of the United Nations. Walters, C. J. 2003. Folly and fantasy in the analysis of spatial catch rate data. Canadian Journal of Fisheries and Aquatic Sciences, 60: 1433-1436.